As Tamil Nadu goes to polls on Thursday, we look at the environmental issues that Chennai faced since the 2014 national elections through the camera lens. The disastrous floods of 2015 and the Ennore oil spill stand out in the list. In addition, the city’s air and water have become more polluted than ever before. The city’s garbage has continued to remain a threat to the environment and health of the people living in the city. Through Amirtharaj Stephen’s lens, Mongabay-India takes a look at Chennai’s environment over the last five years. Since the 2014 national elections, the capital city of Tamil Nadu has witnessed major environmental calamities, from the disastrous floods of December 2015 to the giant oil spill outside Kamarajar Port at Ennore in early 2017. Apart from these distinct events, the vast expanse of Chennai metropolitan area has seen an increase in pollution – both of waterbodies that serve the city’s seven million population and the ambient air. 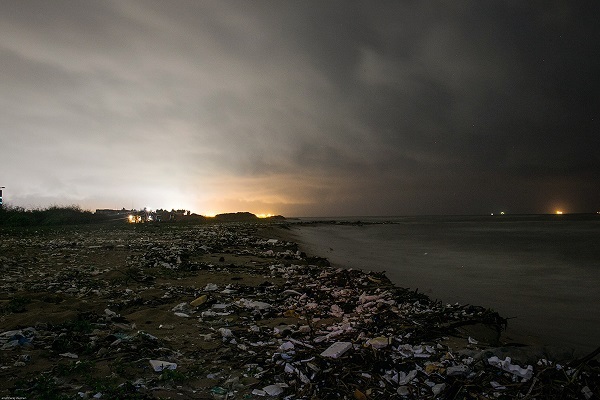 When the floods struck in December 2015, the most iconic images were those of Chennai’s famed beaches lined with mountains of trash. Waste such as plastic materials, wrappers, bottles, covers, metals, scrap and wooden logs were spread out on display along the coastline of the Bay of Bengal in Chennai, across Marina and Elliot’s beaches. Heaps of waste thrown back to the shore at Adyar river mouth near Elliot’s beach during the 2015 floods. 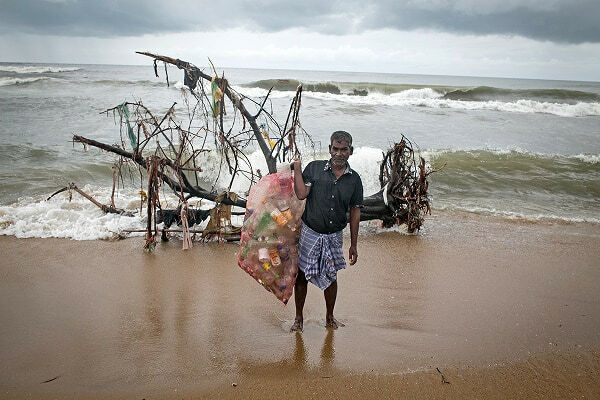 A waste picker with his collection from what was washed ashore at Elliot’s beach during Chennai floods, 2015. More than a year later, during the early hours of 28 January 2017, there was a giant oil spill outside Kamarajar port, when the outbound BW Maple collided with an inbound tanker Dawn Kanchipuram. A total of 251.46 tonnes of black, sticky oil coated the Ennore coast. 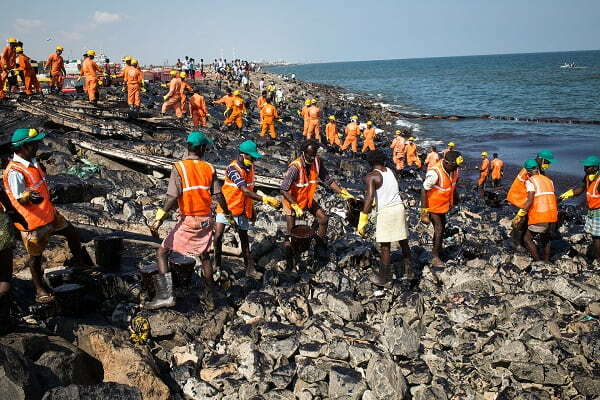 Reports state that the oil spill was removed largely by hand, with more than 2000 volunteers and labourers using mugs and buckets. However, the damage remained toxic, killing olive ridley turtles and other marine fauna on Chennai’s beaches. Kamarajar Port near Ennore witnessed a 251-tonne oil spill when two tankers collided against each other in 2017. The 136 km long Kosasthalaiyar river is the major water source for Chennai, Thiruvallur and a few North Arcot taluks. The river originates from Andhra Pradesh, flowing across Tamil Nadu and draining into the sea at Ennore Creek. 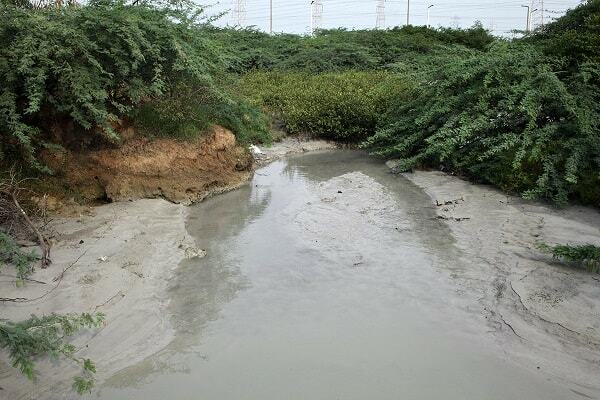 The river enters the Chennai metropolitan area as Cooum river, one of the most polluted water bodies in the district. Kosasthalaiyar was reported to be “more polluted than industrial effluents”, according to a study conducted by the National Green Tribunal in December 2017. Of the total 20 samples taken along the area, all five samples from Kosasthalaiyar contained higher than permissible levels of lead, mercury and arsenic. 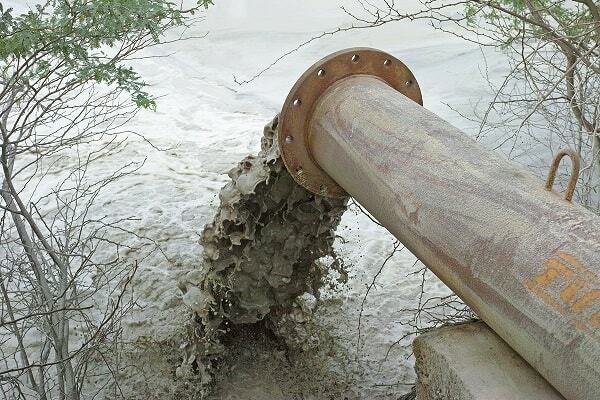 Coal fly ash contaminating the Kosasthalaiyar water, altering the hydrology and affecting the potability of water. Polluted Kosasthalaiyar contains mercury, lead and arsenic above the standard levels for discharge of industrial effluents into inland water. 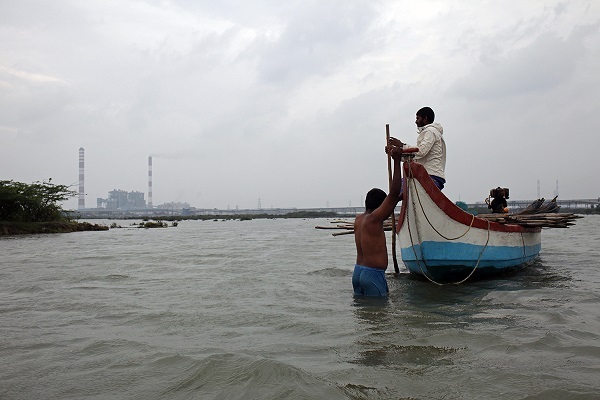 Fishermen near the Ennore plant are struggling to make a living as pollution drastically affects the catch of fish. 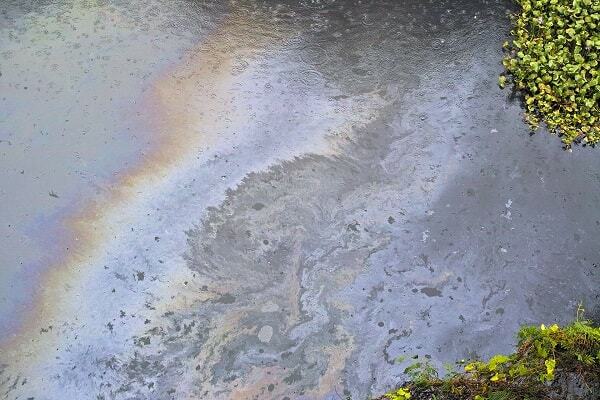 Oil and petroleum waste with high toxicity levels are seen contaminating water at the mouth of Kosasthalaiyar. Drifting away from the shores, the city’s largest dump yard in Kodungaiyur allegedly has 12 million cubic metre of waste, dumped over a period of 30 years. A fire accident in April 2018 brought life to a halt in the area; residents reportedly had to flee to escape the toxic air, the unbearable stench and eye irritation. 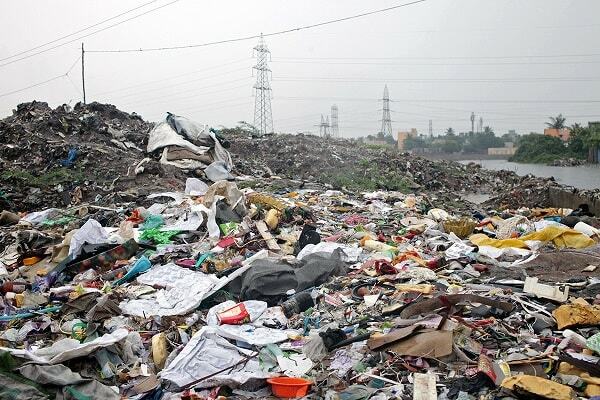 The state budget announced in February 2019, however, has allocated Rs 7000 crores for solid waste management in the city, including the remediation and reclamation of both the major garbage dumps, Kondungaiyur and Perungudi. Heaps of waste dumped at Kodungaiyur landfill. In addition to being a fire hazard, the waste spreads airborne diseases to surrounding areas.